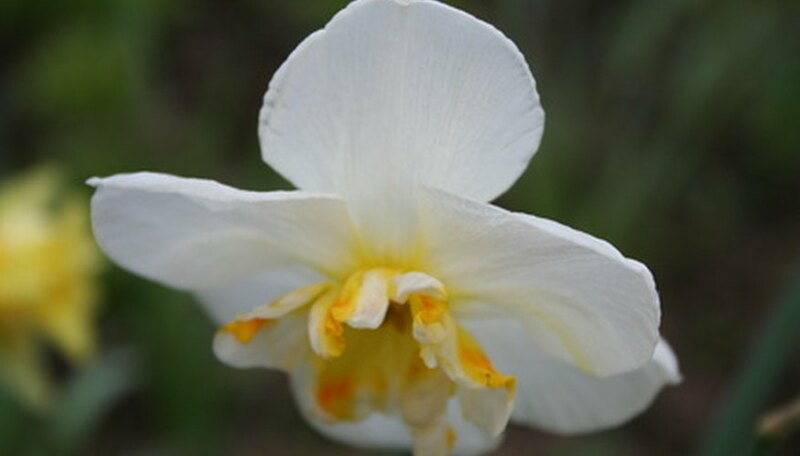 Paperwhite narcissus are a member of the same family as daffodils, and resemble these yellow spring flowers except that the entire blossom is white. Paperwhites are often forced into bloom indoors during the winter months, as they are not cold hardy like daffodils. Paperwhite bulbs can be grown outdoors in the garden if you live in USDA Hardiness zones 8 through 10, as the slightest freeze can kill these tender perennials. Lay a 1-inch layer of compost over a full-sun garden bed that is located in a well-drained area. Apply a balanced fertilizer or a bulb-formulated fertilizer at the rate recommended on the label, then till it into the top 8 to 10 inches of soil. Plant the paperwhite bulbs so the top of the bulb is 6 inches beneath the soil surface. Plant them with the pointed side facing upward. Space the bulbs 6 inches apart in all directions. Water as necessary to keep the soil moist but not soggy. Water once weekly, moistening the soil to a 6-inch depth at each watering. Lay a 4-inch layer of straw mulch over the bulb bed in late fall. Mulch offers some protection in the event of an unexpected freeze, prevents weed growth and also helps to preserve soil moisture. Remove the straw mulch in spring when the new leaves begin growing. Replace with a 2-inch layer of bark mulch, which helps retain moisture and prevent weeds while being more attractive than straw. Sprinkle bulb fertilizer around each paperwhite when it begins forming flower buds. Follow package instructions for application rates. Cut off the flower stem at the base once it is done blooming, using a small pair of shears. Cut the foliage down to ground level once it has yellowed and died back on its own. Plant forced bulbs in the spring once the leaves yellow and die back on their own. Plant newly purchased bulbs in fall. Forced bubs that are later transplanted outdoors may not bloom the first year after being transplanted.